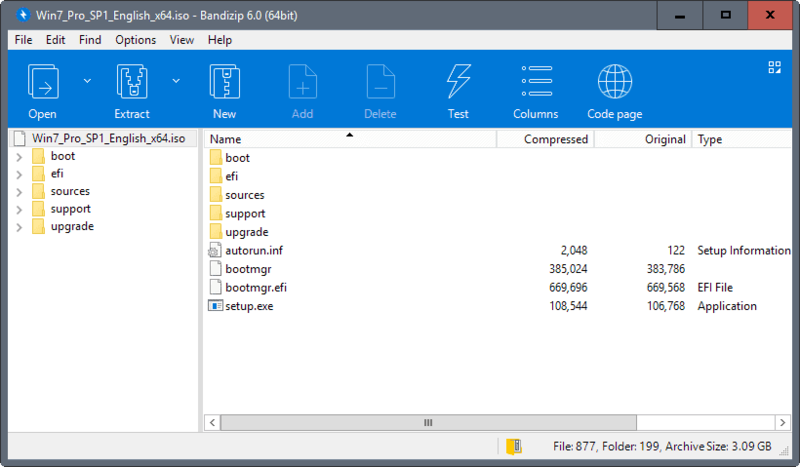 Bandizip is a free file archiver for Microsoft's Windows operating system that supports all major archive file formats and many customization options. While those programs are all great and may be your top choice when it comes to the unpacking of archives on your devices, I discovered a program back that ticks all the right boxes for me. The name? Bandizip. It is a free program for Windows that supports all major and many minor archive formats and comes with impressive functionality. Bandizip support all the features that I require from a file archiver; what those are? Glad you asked. Format compatibility - The program needs to support all major archive formats including zip, 7z, rar (including rar5), gz, ace, tar and others in terms of extraction, and major formats when it comes to archive creation. Convenience - Options to extract one or multiple archives from Windows Explorer and to open extracted folders after extraction. Other features - Unicode and long path support is a must, as are options to customize the context menu and other program features such as search in archive functionality. Bandizip ticks all those boxes. The program supports 37 different file formats at the time of writing including all major archive file formats but also disc image formats such as ISO or IMG. The application is available as a portable version or setup for Windows as well as a (paid) version for Apple's Macintosh system. If you install the program on Windows, the file association settings page is opened right afterward. Here you can associate archive file formats to open with the application so that archive formats open in Bandizip when you click on them on the Windows machine. Doing so will replace the icon of associated archives with the Bandizip icon. It also allows you to double-click the archive to run an action configured in Bandizip on it. One interesting feature of the application is the ability to change what happens when you double-click archives. The default action is to open Bandizip to display the content of the archive. You can change that however so that the archive gets extracted automatically for instance instead. Tip: you can add unsupported archive file types to Bandizip if they use a supported format. CBR files are renamed zip files for instance, and you may add support for them in the Bandizip options so that they are opened with the program. Bandizip displays archives in two panes. The first pane displays all folders of the archive and the main pane the folders and files of the selected level. You can use the sidebar to navigate between folders quickly and run any file directly using the interface. A click on a column sorts the archive data based on the selection. A click on compressed sorts by the largest compressed file while a click on modified by file modification date. The application supports several extraction options, for example, to extract to the current directory or an "archive-name" directory, or to a directory that archives were previously extracted to. Bandizip is highly configurable. Open the Settings with a tap on F5 or by selecting Options > Settings from the menu. We talked about associating certain archive file types with the program already; you can integrate it in Windows Explorer using various extraction and compression options to run these actions directly from the default file browser. What I like about this in particular is that you can select the actions that you want in the Explorer context menu. Instead of having ten or so actions displayed there, customization enables you to display only those actions that you want in the menu. Users who don't use Explorer or don't need to control archives using the context menu can disable integration entirely as well. Configure what is displayed in the context menu and what is not. Option to open the folder of an extracted archive after the operation completes. Handling of long path names that exceed 260 characters. Customize the Bandizip interface to display or hide certain information. Configure the program to handle certain unsupported file types as archives, e.g. cbr or cbz files. When it comes to creating archives, Bandizip may not support a massive number of options but the important ones are there. It can create eight different archive types including zip and 7z, split up volumes, add password protection, set up self-extracting archives and change compression levels. 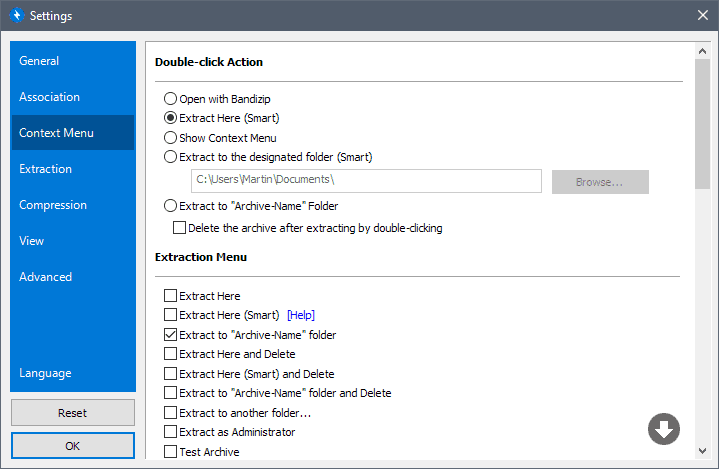 Select New Archive in Bandizip, or right-click on files in Explorer and select the New Archive option there directly. Add files to the archive using drag & drop or the "add" button. Select a desired filename for the archive and output path. Select one of the supported archive formats, e.g. zip. Select whether to split the archive into multiple volumes. Enable encryption by checking the password box and entering a password. Most archive creation settings are optional. The fastest way is to simply add files and click on start to create the archive using the default parameters, or to right-click on files in Explorer to create archives this way. Additional options are provided; you can enable test mode to test the archive, or select to delete files after successful archiving. Note that the latter removes the archived files from the system. Bandizip is one of my favorite archive manager. It’s pretty fast than other utilities, and reliable as other popular ones. I think it is more user-friendly than 7zip, another free archiver. Winrar, which I think the best of all, provides several advanced features like NTFS high-precision timestamp while Bandizip doesn’t. But it will be no problem for general use. Most of all, Bandizip is free, even for commercial use! I am happy with bandizip. i tried lot, including 7zip ,finally settled with bandizip. 7-Zip still has a major advantage: it offers a msi file. Which means deploying the tool in the corporate world is as simple as a click. Yeah, this pretty good and you can still use 7-Zip’s archiving exe if you want. I’m still happy with winrar. I took the time to register it a while back and it’s been nothing but good. Whatever magic voodoo WinRAR has going on behind the scenes, it’s been able to successfully open archives that choke other programs like 7-Zip. That’s why I swear by it, reliability. I’ve literally ran an archive through two or three different programs, each of which told me it was corrupt, then tried it in WinRAR and had it open the archive without a hitch. WinRAR used to be one of those shareware programs where everyone runs the trial indefinitely, but it’s honestly worth the money, just to support continued development. I have been using it for years. I love it. Oh nice, it supports the creation of separate archives for multiple files. I’m going to switch to Bandizip for some time and see how I like it, but so far I like what I see! 7-Zip using the 7z format takes 40 minutes to archive my personal files. Bandizip does it in 20 minutes. That only means it’s using different (lower) compression settings. Been looking for a replacement for 7-Zip for much the same reasons. Will give this a try. Just did a quick and dirty benchmark and as you might expect it performed almost identically to 7-zip. So given the advantages outlined above by Martin, at this point, it seems like this software will be a keeper for me. ALZip is another freebie which does as much as WinRar and more. It is from the makers of the ALShow (previously named ALPlayer) all in one media player with built in codecs and much prettier GUI than VLC that I love so much. They also have a MAC specific version. I used Alzip before, but bandizip is much faster than that. ALzip is popular program and I used the program,but ALzip is bad. I want not to use the program because it is TRUSH. you don’t need alzip anymore since bandizip is released. Hmm… I don’t think so. While I have been also using 7-zip for years, there are some shortcomings that have literally irked me. I) When extracting files to a folder, it first extracts the file to a folder and then copies it back to the final destination. ii) It does not keep broken archives like WinRAR does. Been using 7-Zip for ages but am using this now on your recommendation. It cannot compress in rar format…that’s a no-go for me..
No other software other than WinRAR is able/allowed to compress RAR files, the creators made illegal to reverse engineer the compression algorithm. They did open source the decompression algorithm though. Well, 7-Zip is more or less a one-man-project by Igor Pavlov so it’s only logical there are not much stable releases until all reported problems get a fix. This is a version from yesterday, as in the comments mentioned, Igor working on Rar5 support. Been using WinRAR over a decade and never had any problems with it what so ever, but this freebie seems to be useful, never know when your going to need another one, plus it’s portable cool. Bandizip 1.2.4 for mac is a older version than the Windows version actual 5.0.3. So Bandizip is a no go for me on the Mac. Hi Martin, Id have to agree that bandi is definately one of the best but you might want to also checkout zipware which is relatively new but very solid and has a few extra features. I would love anybody doing a serious review about archivers to look up on B1 Archiver for windows and Mac. It can convert Rar into B1 format and then unpack the B1 format. I would say PeaZip 6.x onwards has slightly the upper hand for the power user, imho maily for the scripting, secure auto-delete, and archive conversion routines. Also, it is open-source, so licensing is not an issue regardless the size of your organization. For my use I’ve found no reason to move away from 7-Zip yet, but I always like to have an alternative in the ready, so I will definitely give Bandizip a spin. Right now PeaZip is my alternative choice to 7-Zip. Thanks again for this tip Martin!